Email customer newsletters are a great way of keeping in touch with customers and generating sales/leads especially for small businesses. One of the biggest successes I had creating newsletters was for a Redhill-based jigsaw puzzle retailer. The small business had at one point over 50k opted-in subscribers to their newsletter list (which I helped to build up). The online retailer was taking £20k a day during the busiest months! It was the quieter months, however, when the newsletter really came into its own. When the chatty newsletter was sent, orders used to typically tripple. 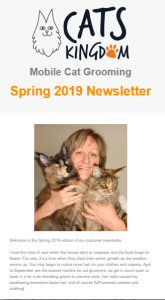 With the last edition of the Catskingdom newsletter that we produced, one of the groomer’s own customers liked that newsletter so much that they wanted one done for their own business which we did. We also created a new digital marketing strategy for them. Catskingdom also had lots more enquiries as well! 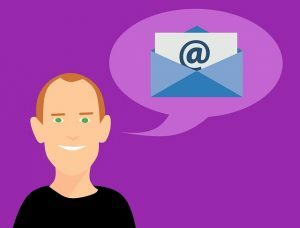 You can find out more about our email marketing service here. I interviewed Alan, who owned a jigsaw puzzle business, for a webchat for My Business Support. He explains how the email newsletters I put together helped his business take over £20k a day.